We spent nearly 50 hours testing 5 full tower PC cases, and we’ve concluded that the Corsair 1000D is the best ATX full tower case on the market. Calling the 1000D huge would be an understatement – this ‘super tower’ is built to support the biggest and most powerful components on the market. 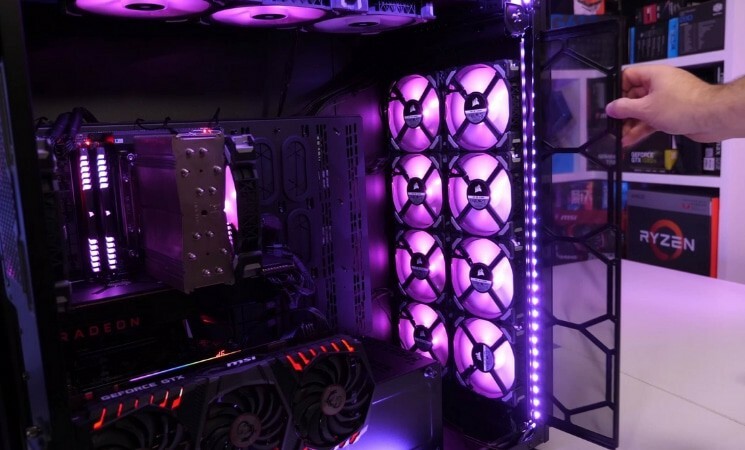 These 5 large computer cases are still perfect for enthusiast builders who want to overclock their rigs this 2019. Featuring spacious interiors and sleek designs, they give meaning to the phrase “the bigger the better.” If you’re interested in seeing what sets them apart from other full-size PC cases, then read on. The Cosmos C700P is one of Cooler Master’s largest chassis to date. 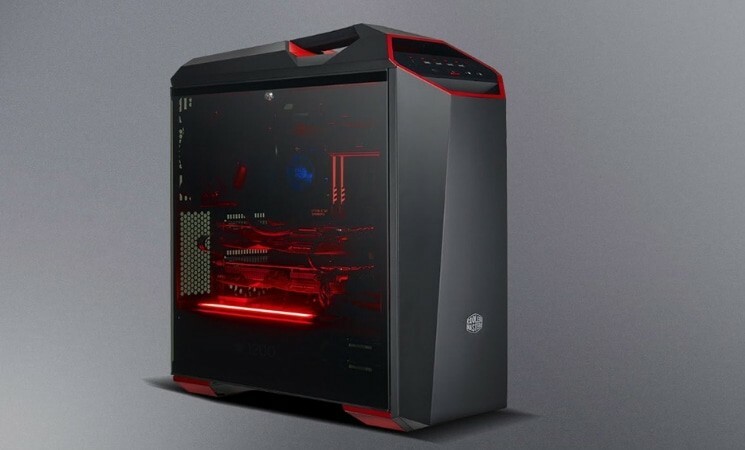 It’s also sleek and modern thanks to its curved tempered glass window pane that showcases the interior, illuminated by the case’s two RGB lighting strips on the top and bottom. 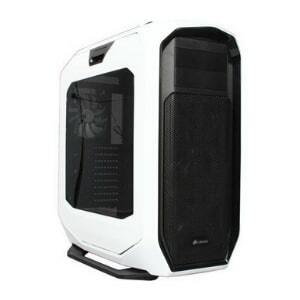 The case supports high-end components such as E-ATX motherboards, 420mm radiators, and several graphics cards. The price tag is a bit high, coming in at over $300, sometimes anywhere or under $300 – that’s more than most spend on a processor or graphics card. Obviously, this case is meant for all-out builders. The Corsair 1000D is bigger than what most would consider a full tower, which is why Corsair refers to this case as a super tower. The PC is so big, it can actually hold two motherboards and two power supplies, meaning it can house two separate PCs at once. This case is monstrous in size, and it’s meant to house a monstrous build. If you intend on attempting any serious overclocking or you want to configure several GPUs in SLI/Crossfire, this is the case for you. 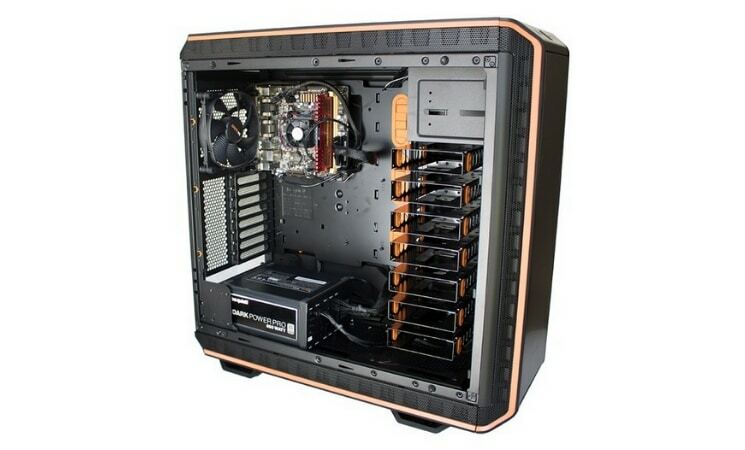 It can support more fans than just about any other case on the market (18) and up to 4 radiators. 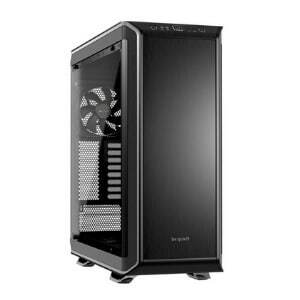 This good looking full tower case features a tempered-glass side panel window, plenty of cable management routing options, flexible drive-mounting, and a steel construction. Although the H700i is technically a mid-tower case, it’s significantly larger than most. 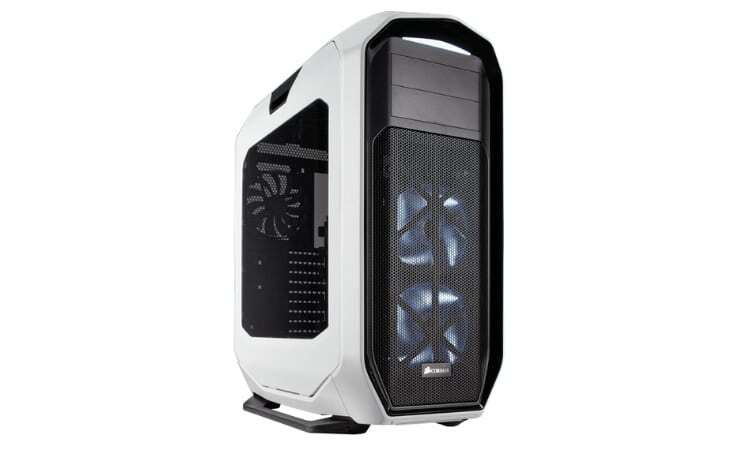 This is a big PC case whose spaciousness would lead you to believe it’s actually a full tower case. The case’s octagonal design catches one’s attention immediately; it looks like it could be the personal computer of a stormtrooper. This case is incredibly easy to work with for a lot of reasons. The side panels are easily removed by lifting up on their handles. Its highly-vented and spacious interior promotes exceptional airflow, which is aided by the bevy of fan/water cooling options. Oh and it has great cable management. The 780T has 15 drive bays, 9 expansion slots, and it can support a plethora of either 120mm or 140mm fans, not to mention water cooling radiators. The award-winning manufacturer be quiet! has delivered yet another superb case. Forged from steel, the Dark Base Pro 900 provides sufficient airflow and its modularity allows you to configure it in dozens of different ways. This be quiet! Dark Base lives up to its be quiet! brand by being quiet. The case’s included case fans perform well, especially when it comes to their acoustic performance (or lack thereof). Combined with the thick noise-canceling foam, you won’t have to listen to noisy fans whirring. When it comes to choosing a case for your new PC build, there’s more to consider than meets the eye. If you’re new to PC building, you have a lot to learn – this section is going to make your life a whole lot easier. Your motherboard’s form factor is the first thing you need to consider before buying a case since large motherboards can’t physically fit into smaller cases. The three most popular form factors are: ATX, Micro-ATX, and Mini-ITX. For example, you won’t be able to fit an E-ATX or ATX motherboard into a Micro-ATX or Mini-ITX case. Often times, larger cases support small and large form factors, but it is best to research to ensure compatibility. Smaller cases have less room for components, and they tend to have less features as well. If you’re a minimalist, this isn’t a problem. Large cases, on the other hand, are ideal for enthusiasts who are building a high-end PC. Full-tower cases are the largest cases and can work with ATX, Micro-ATX, and Mini-ITX. Their large size is more meant for extra components rather than exceptionally larger motherboards. Mid-tower cases are the most popular and can also work with motherboards that are as large as ATX. Mini-tower cases sacrifice the larger ATX boards, but can still use Micro-ATX and Mini-ITX boards. In case you didn’t know, PC components emit a lot of heat. Components are designed to operate at high temperatures without being damaged, but they can still be destroyed if their temperature rises too high for too long. This is where your case fans come in – when a cooling system is properly configured, your case fans will supply your components with cool air to prolong their lifespan and prevent damage. Fan configurations will vary based on the design of your case and the amount of airflow your system needs. 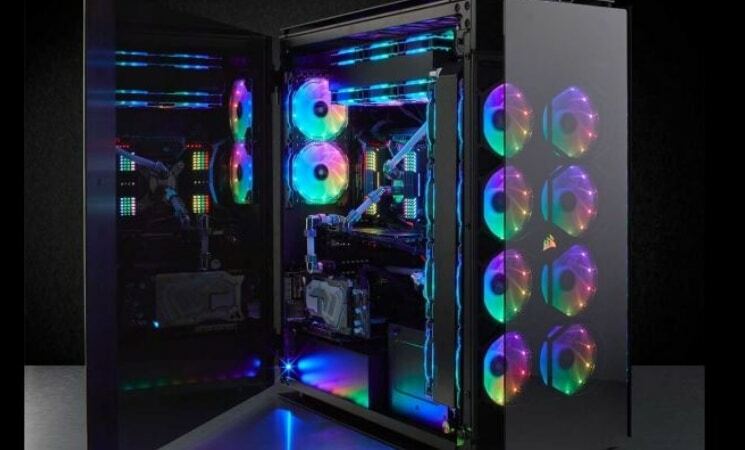 I’d recommend using a push/pull configuration – some of your fans are drawing cool air into the case, and the rest are exhausting hot air from the rear. This way, your components will be subject to a constant stream of cool air, and the hot air that would otherwise be trapped inside of the case is expelled. 3.5-inch bays are used for standard mechanical hard drives. 5.25-inch bays are used for optical drives (aka DVD or BluRay readers). However, many manufacturers have started to do away with 5.25-inch optical drive bays since physical disks are becoming less and less popular (or needed). Building a computer requires you to plug in a lot of cables. Once all is said and done, you’re going to need to actually do something with those cables, rather than letting them sit there in a big jumbled mess. Most cases have lots of cable management options, such as grommet holes in the motherboard panel. But you need to do research since you can run into unforeseen problems. For instance, the case I used in my first PC build didn’t have enough space underneath the back panels for cables. Just because your case is equipped with a lot of case fans doesn’t necessarily mean they’ll do their job quietly. Nobody wants to hear a constant whirring noise in the background, so make sure your case fans are quiet. When you read reviews online, pay attention to the cases fans’ dBa audio levels. Some cases also have some degree of sound proofing which also makes them much more quiet, but these are generally a little more pricey. Ensure your case’s build quality is of solid construction. If it has a side panel window, tempered glass is ideal. Plastic here and there is fine, but you can’t go wrong with a steel frame. Now it is time to look at each case, examine the pros and the cons, discuss the cases’ design, and any notable features. The case is constructed from plastic, aluminium, and steel. 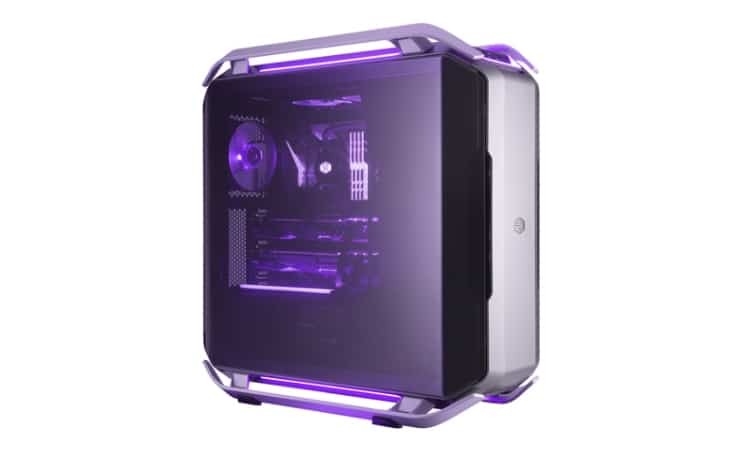 It has a large tempered glass panel on the side, and its spacious interior has room for even the biggest XL-ATX motherboards, but it also supports E-ATX, ATX and Micro-ATX boards as well. The spacious interior has plenty of room to mount fans and radiators, so you can rest assured knowing your components won’t suffer from a lack of airflow. The case ships with three fans pre-installed, but there is room for an extra 4 (max of 7). In the rear of the case, you’ll find a 140mm, 1,200 RPM exhaust fan that is accompanied by 8 expansions slots which can accomodate multi-GPU setups in SLI or Crossfire configurations. The PSU is mounted in the bottom rear of the case. The PSU section can accommodate just about every PSU on the market, so you won’t have to worry about compatibility. Now I’d like to discuss the modularity of the case because the Cosmos C700P is fully modular, meaning you can configure it in a plethora of different combinations. The rear of the case has a plastic ring that can be popped off, and a set of mounting slots for 120mm fans. The fans can be moved up or down for ideal radiator placement. The case’s side panels snap into place, and they can be easily removed to expose the power supply, drive bays, and the motherboard tray. The fascia lifts off after being swung out, which makes it easy to access drive bays. Behind the front intake panel, you’ll find two mounted 140mm fans and a triple-fan bracket. If you wish, you can replace a 5.25-inch bay with included dual-bay brackets. Another triple-fan bracket is located underneath of the top panel. Behind the motherboard tray you’ll find two more 2.5-inch drive bays, one of which contains Cooler Master's custom light and fan controller. There are a few modular brackets that run up and down to support the 3.5-inch drive and motherboard trays. The C700P allows for a variety of alternative configurations. It’s a wonderful case for beginners and experts alike, and it’s especially good for people who love to tinker with their PC to find the optimal configuration. The Corsair Obsidian 1000D is more of a behemoth than a full tower case. Its gigantic size has warranted the nickname super tower, and for good reason – nothing about this case is short of super, including the super high price tag. If you can get past that, this case is stupendous. It supports ATX, Extended ATX, Micro-ATX, Mini-ITX, and SSI EEB. Standing at nearly 700mm tall, this case is larger than any case I’ve seen before. 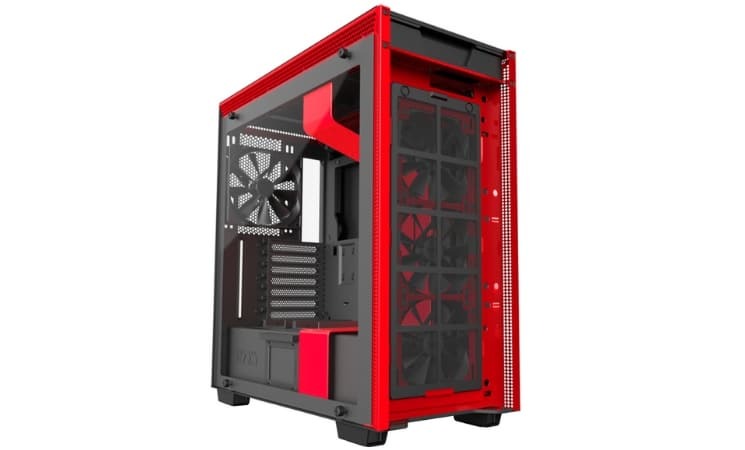 Its humongous interior has enough room to accommodate up to 18 case fans (8 120mm fans can fit in the front of the case alone) and up to four radiators; all at the same time. The 1000D features a special triple-chamber design with french-door-styled compartments – it's so big, in fact, that it can house an E-ATX build and a mini-ITX build at the same time. 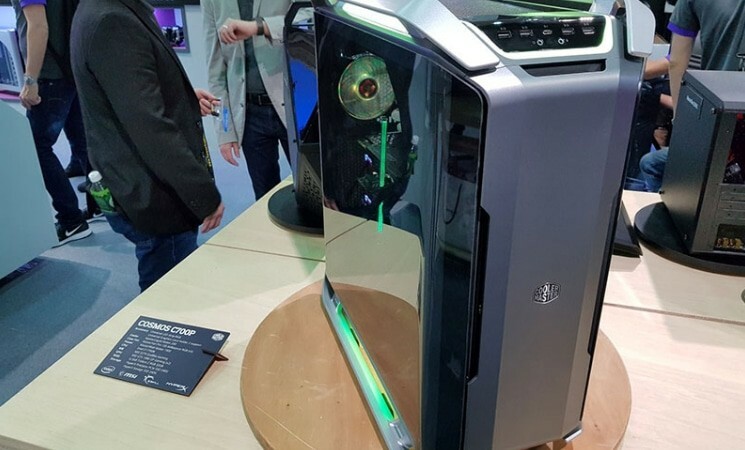 The case’s exterior is surrounded by tempered glass. The top has two flanking brushed aluminum panels that are oh so lustrous and is raised from the rest of the chassis to allow for air exhaustion. The front offers plenty of space for air intake through the dust filter. Finally, the back panel of the case has seven expansion slots. Storage capacity is also impressive, as the case has enough room to fit five 3.5-inch HDDs and six 2.5-inch SSDs. Traditional 3.5-inch hard drives and 2.5-inch solid state drives each have their own storage chamber, both of which are located next to the PSU shroud. Speaking of which, you’ll find space for two power supplies and a Mini-ITX sized motherboard towards the bottom of the 1000D’s interior. The front I/O panel has RGB lighting with built-in smart lighting and Corsair’s Commander Pro fan controller. The fan controller and lighting controller allow you to control up to six PWM fans and two RGB LED strips, in addition to having four temperature probes. 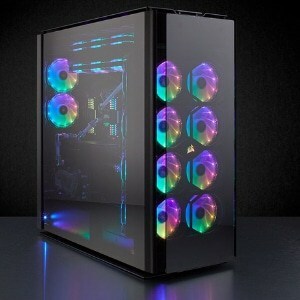 With its insane number of mountable fans and RGB lighting options this is one of the best cool full tower cases (get it?). It’s important to note that the NZXT H700i is technically a mid-tower case, not a full tower. Nevertheless, being significantly larger than most mid-tower cases means it is still basically a full size PC case. 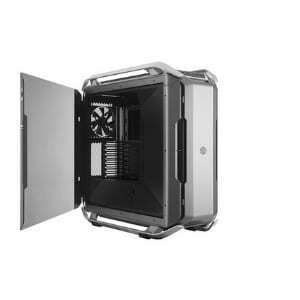 This case supports E-ATX, ATX, Micro-ATX and Mini-ITX motherboards. It’s important to note that many manufacturers list support for E-ATX boards up to 10.7”, but true E-ATX motherboards measure 12 x 13”. This case only supports E-ATX boards up to 10.7”, so if you plan on using a full sized E-ATX board, you’ll need to choose a different case. The right side panel has a one-touch release design that allows for instant access to the space behind the motherboard tray. The case has air intake ventilation on both side panels and the top panel, providing plenty of fresh air to intake fans. Behind the case, you’ll find the motherboard I/O, seven expansion slots, and the opening for your power supply. The rear exhaust fan mounting location supports both 120 and 140mm case fans, but the case includes a 140mm exhaust fan already. The mount has slotted screw holes which allow you to slide the fan up or down. This feature conveniently allows you to create space for components or fine tune the case’s airflow. 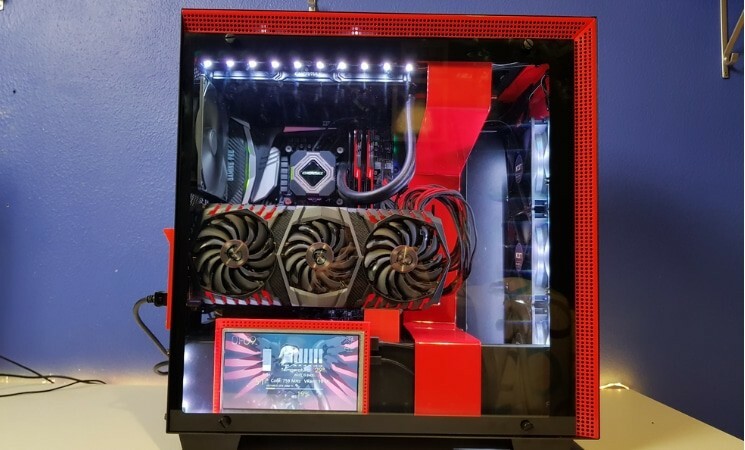 Despite being equipped with a 140mm exhaust fan and three 120mm intake fans, there is still sufficient space for a custom cooling loop, reservoir, and multiple GPUs running in an SLI or Crossfire configuration. The factory installed fans should provide ample airflow to even the most demanding systems. 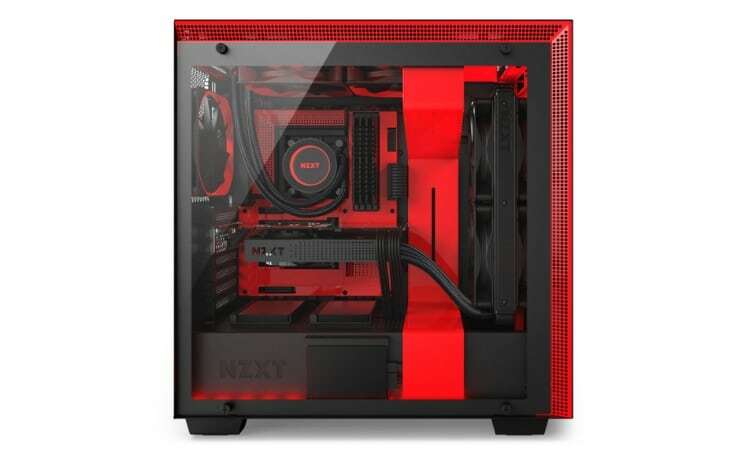 NZXT calls the H700i a “smart case” because the chassis uses an Adaptive Noise Reduction algorithm that adjusts fan speeds based on noise levels and CPU/GPU temperature changes. The case also comes with a fan controller/LED lighting controller. The fan controller can support up to five RGB fans, and the lighting controller can support up to four LED lighting strips. The case also features a red cable management bar that helps to hide wires and clutter. There is a 10” x .5” hole in the top of the motherboard tray which allows the 12V motherboard ATX power cable to be passed through to connect to the motherboard. There is also a big hole in the motherboard mounting plate which allows you to change the heatsink without removing the motherboard. As for drive space, there are three 3.5-inch drive bays and seven 2.5-inch drive bays. Two of the 2.5-inch drive bays are convertible from the two 3.5-inch drive bays that are located under the PSU tunnel. There are five dedicated 2.5-inch drive bays, three of which are located outside of the PSU tunnel, while the other two can be found behind the motherboard tray. The hard drive racks also below the power supply tunnel, giving the case’s interior plenty of extra room for water cooling components. Thanks to its excellent cooling performance, design, and features, the H700i is definitely worth considering. The Corsair Graphite 780T has rounded, hexagonal corners and an angled nose that slopes down from the bezel’s top-center. Under the nose, you’ll find a thin white backlit strip, as well as, two 5.25-inch optical drive bays and two LED-backlit 140mm front intake fans that live behind an enormous dust filter. The side doors also have handles which are used to effortlessly remove (and reinstall) the side door panels. The 780T provides a ton of cooling options and ventilation, not to mention expansion capability. Behind the front grille, Corsair has included two 140mm intake fans, but the front of the case can also accommodate either three 120mm fans or a single 280mm or 360mm radiator. In the rear of the case, you’ll find two tubing holes for water cooling pumps. A 140mm exhaust fan is located right above these, which brings the total number of included cases fans to three. The case does support another pair of 120mm fans on the bottom, but the plate holes are not pre-grommeted. By the way, the rear exhaust fan is mounted on one inch-long slider rails that allow you to fine-tune the fan’s placement around other components. This added flexibility can come in handy, especially if you’re using this case for a water cooled rig. There are six 3.5-inch drive bays and two 5.25-inch drive bays, and lastly, there are three snap-in 2.5-inch drive caddies that can be inserted into a 3.5-inch drive bay to accommodate SSDs. Some may prefer dedicated 2.5-inch drive cages, but their decision to exclude them from the case saves space. Altogether you’ve got nine drive bays for hard drives and SSDs. Lastly, it is worth noting that the case is mainly constructed from plastic, which isn’t ideal for a case in this price range. Personally, I would have preferred stainless steel or brushed aluminum. In any event, the 780T is aesthetically pleasing and more importantly, incredibly functional. The be quiet! 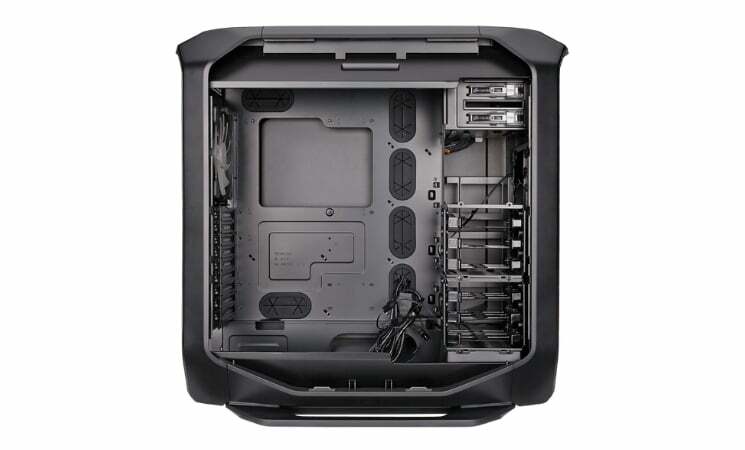 Dark Base Pro 900 is enclosed by a steel frame with orange accents between the beveled edges and supports XL-ATX, E-ATX, ATX, Micro-ATX, and Mini-ITX motherboards. Flexibility is a common theme here, as the case has plenty of cooling and cable management options. Tinted tempered glass covers the left side panel of the chassis, giving the case a covert look and feel. The bottom of the case is lacking ventilation, but there are two internal fan mounts that draw in cool air from between the two panels. The motherboard tray can be installed at different heights on either side of the case. Dropping the tray one hole still provides enough space for a single slot card to be installed at the bottom of the board. The HDD storage system is also customizable. The motherboard side panel has a hidden fan mount that can accomodate two 120mm fans. Noise-cancelling foam within the Dark Base Pro 900 reduces fan vibrations. The case ships with three Silent Wings PWM case fans pre-installed, but it has 10 fan mounting locations in total. This case supports water cooling radiators, from 120mm all the way up to 420mm, and radiators can be mounted on the top, bottom, or the front of the case. Watercooling support is extraordinary. If you’re building a high-end gaming PC, you’re going to need a case with plenty of room, cooling support, cable management options, drive bays and extra features. These best full tower cases provide just that. If you want a case with a premium feel, loads of cooling support, and overall superb build quality, go for the Cooler Master Cosmos C700P. The Corsair Obsidian Series 1000D is a monstrous case with more room for case fans and water coolers than any other full tower case – in fact, it has enough room to house two PCs at once! Looks are important when it comes to picking a case. 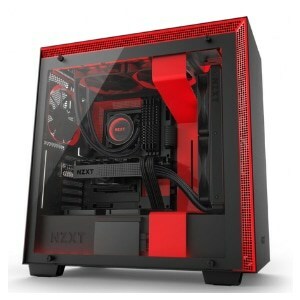 The NZXT H700i is our pick for the most stylish case on this list. The Corsair Graphite Series 780T’s spacious interior and cable management options combined with its 9 fan mounting locations gives this case some serious cooling potential. be quiet! has manufactured a case that boasts excellent acoustic and thermal performance, thanks to the Dark Base Pro 900’s powerful case fans and side panels lined with noise-cancelling foam. We hope this helped you not only understand why it’s important to choose a good full tower case, but also how to make better decisions in general. Do you think we covered everything there is to know about full tower cases, or do you have some other questions (or suggestions)?